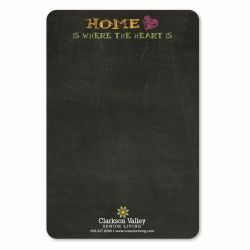 An outstanding addition to any classroom, office or home, this rectangle chalkboard magnet will make a lasting impression! Measuring 8.25" x 5.5", this useful and eye-catching item features a piece of chalk with a magnetic holder so you can turn your refrigerator or other magnetic surface into a chalkboard. Customize each one with a four color process imprint of your company name, logo and more for increased brand visibility on a fun handout! Size: 8.25 " x 5.5 " x .01 "